Both of us were born when India was still struggling for her independence. One was in the final year of school when Jawahar Lal Nehru made his famous speech about India waking up to make her tryst with destiny; the other was a child speaking a first few words. Our families were not known for riches or power. Destiny in the form of the progressive measures taken by independent India to harness science and technology in order to develop a modern nation brought us together. It was the vision of the great Vikram Sarabhai, supported by Nehru and Homi Bhabha, which gave us the opportunity to work on the space programme. The programme was aimed at carrying developmental messages into homes all over the country, especially in the 6 lakh villages, by leap-frogging many traditional routes. The programme also aimed at surveying the natural resources of the country so that they could be harnessed to benefit our people. Many in India must have considered these objectives an unattainable dream in the early '60s when the space programme was born. We, however, along with many of our colleagues, saw these aims as a vision real and attainable. What followed was a shared mission. Every person in ISRO believed that they were born to realize all that space technology can bring to the country and its people. For us, then, there was no going back. There were days and nights of work. Many failures and a few hard-won successes. The systems which were designed, developed, fabricated and tested were directed towards a common goal-a strong India, a developed and proud India with the benefits available all over the country. It is gratifying to note the vision, in relation to space technology, has come true now especially in terms of reaching out to the people; providing communication through networks in remote areas; disaster warning systems; quick resource surveys to target ground water, save our forest cover and so on. And, of course, in areas of certain strategic strengths, vital to India in a world which respects only strength. We are also proud and happy that the dreams of many Indians in the agricultural, scientific, artistic, cultural and social fields have also come true. However, the vision of a prosperous India without poverty, an India strong in trade and commerce, an India strong in many fields of science and technology, an India with innovative industry and with health and education for all, has remained just partially realized. In some areas, in fact, pessimism has taken deep roots. We have completed the fiftieth year of our independence, with a large majority born after independence. 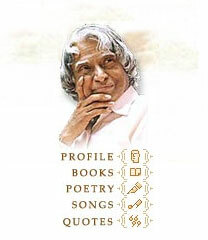 Every year about twenty million Indians are being added to the nation. What vision can they have? Should we, like some, question the very concept of development and leave our people to the same condition of stagnation which existed for centuries? Or think only of the upper strata of society and leave the rest to their fate, employing such nice sounding phrases as 'market driven strategies' and 'competitiveness'? Or leave the initiative to various globalizing forces? Where should we see India (and its people) going in the next two decades? In the next five decades? And more? The authors were fortunate to have been associated with a large number of persons who were interested in posing these questions and finding some answers. These came substantially through a novel organization, the Technology Information, Forecasting and Assessment Council (TIFAC), which launched a major exercise called Technology Vision for India up to 2020. About 500 experts with unique experience in industry, academia, laboratories and government administration were deeply involved in the exercise. Experts and socially aware persons also participated. About 5000 people contributed indirectly through responses to questionnaires and other inputs. Subsequently, while the teams deliberated on various issues and the draft reports, and later when the report was released by the Prime Minister on 2 August 1996, we had numerous opportunities to interact with many others about a vision for India. We had the benefit of various inputs ranging from encouraging suggestions for specific actions to pessimistic comments about the inability of systems to act on anything focused and long term. We travelled widely to interact with different sections of people in variegated parts of the country. We also reflected on the imperatives for India in a changing world. We are aware of our systems of governance and social and political compulsions. We are fortunate to have gained experience in implementing projects involving people of various strata as beneficiaries, as well as projects entailing strong commercial pressures and those that are high profile, such as a satellite or a launch vehicle or missile project. The execution of these schemes provided varied experiences, which worked as base line knowledge for the shaping of this book. Having taken these factors into account and after studying several vision reports of India and other countries, we still believe firmly that India can reach a developed country status by 2020. The Indian people can rise well above the present poverty and contribute more productively to their country because of their own improved health, education and self­esteem. India can have considerable technological strengths, so crucial for its strategic strengths and for economic and trade related strengths. In this book we have attempted to share some of these thoughts. We have also disclosed elements of a few action plans, which can be missions for many young people in the country. We hope that these will help to stimulate young Indians and ignite their minds in the same way that we were ignited by the space programme three decades ago. Our vision ahead for the country and the missions we see before us make us feel young even now. A developed India, by 2020 or even earlier is not a dream. It need not even be a mere aspiration in the minds of many Indians. It is a mission we can all take up-and accomplish. Ignited young minds, we feel, are a powerful resource. This resource is mightier than any resource on the earth, in the sky and under the sea. We must all work together to transform our 'developing India' into a 'developed India', and the revolution required for this effort must start in our minds. 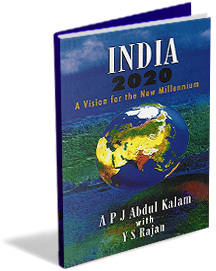 This book, India 2020, will hopefully be the source for igniting many minds.